It's a part of the section titled Helpful Gardener's Tips & Suggestions for New Members, which also contains other information you may find useful. Can anyone help me? I need to now what kind of roses (are they even roses?) I have here. We bought the house in July and are slowly learning how to care for our plantlife. Do I need to prune them? How much and when? Thank you so much! Yes, that's a rose bush. Unfortunately, I have no idea what kind it is. I know little about roses, although I've grown them in the past. At present, I only have miniature roses in containers. I would say you should probably prune them somewhat. Pruning won't harm them, and they will sprout new growth in the spring. I think if you don't prune them now, you'll have to anyway in the spring, because the branches will probably suffer some winter die back. One of our members who knows more about roses should be along eventually and give you better information. They look like hybrid teas . We don't prune our hybrid teas (or any of the roses) until spring. We do tie tall ones so the wind doesn't rock them. Winters are severe here and we only have 6 inches to a foot of live cane in spring. We just cut all the dead cane off in spring. Are your bushes grafted? 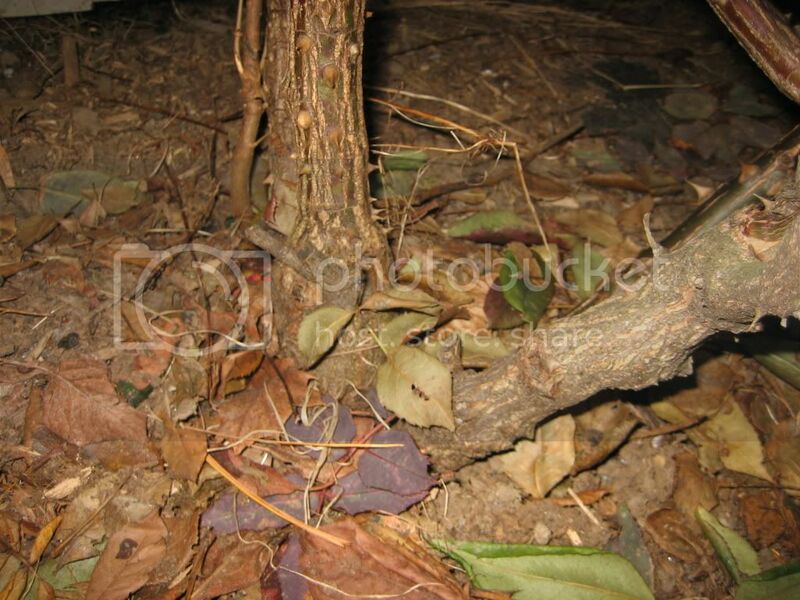 If they are grafted and the bud union (lump) is above ground, you may want to cover it with some mulch in winter. We plant ours with the bud union 2 to 4 inches below ground and mound with some mulch. thank you all so much for your help. I'll take any advice anyone else has. Thanks for the help with pic...not sure what I did wrong! but can you get us a closeup of a blossom, both closed and open? Unfortunately, New England winter has arrived. This is the best I can do for a picture of whats left of a bud. If this is what you're referring to as the bud union, I'm afraid, as of this morning, it's under a foot of snow. Please feel free to edit my post so that the photos can be viewed in case I didn't add them correctly. I think the easiest way to ID these is to search about them for their 'dogtags' they will be either still attatched to bushes near the graft , or most likely laying just under the surface of the soil where they have most likely fallen. Where are you located? What city? This will help us determine how to best prep these roses for winter. See, How you prep roses for winter is very location dependant. For example, you you live in an area that gets brutal cold without a persistant snowcover. Further south, Like where I live in zone 6a Kentucky, we don't have the need to bury our grafts becasue we don't have to suffer long stretches of sub freezing. Most winters I don't even bother to cover the grafts. 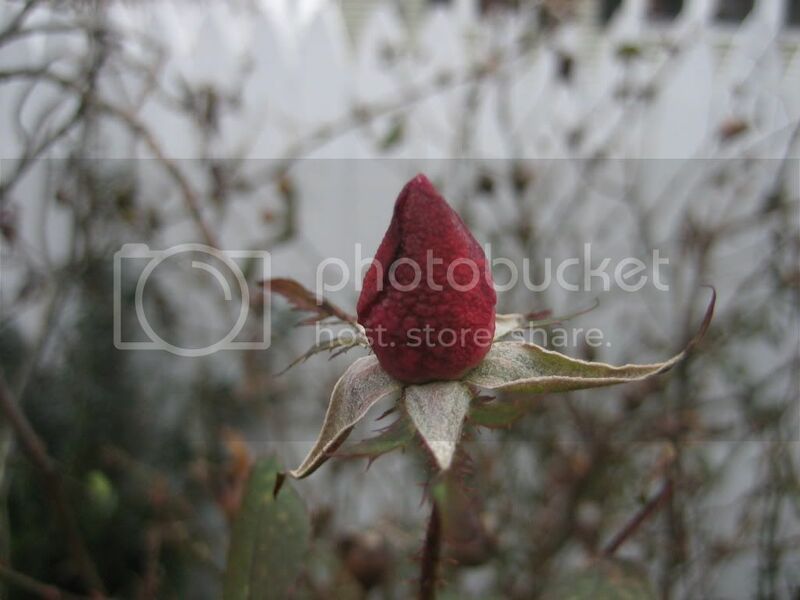 Haven't lost a rose due to freezing yet. Blackspot and Thrips are another issue altogether LOL. 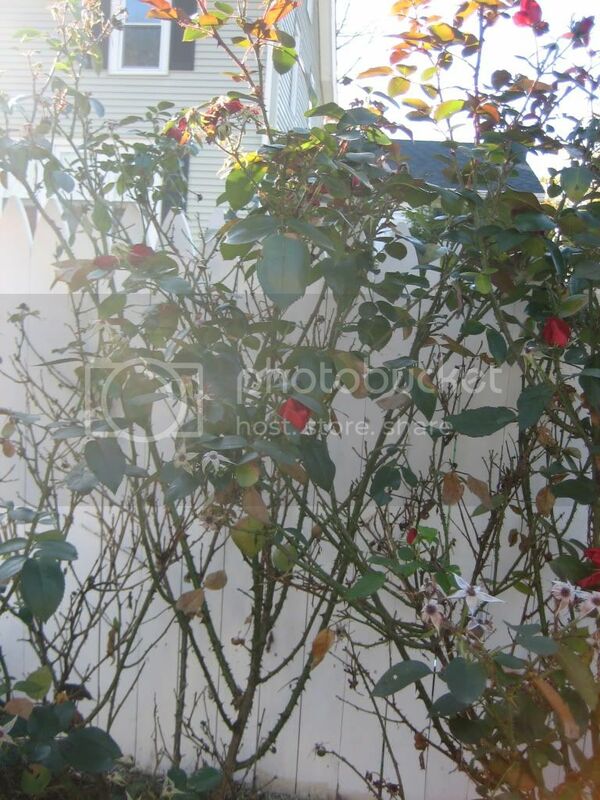 I see a couple of other rose bushes in your original picture. Are they the same as the one in the center? My impression of what roses thes are are that , by shape of the buds, and the appparant one bud per stem that this is a variety of Hybrid Tea. Can't tell for certain which variety without an open blossom. I am havign to work with a few assumptions. I am assuming that these are not a rare or even uncommong variety. I am also going to assume they were store bought and not mail ordered. This leaves us with iether one or two growers/distributers..Star roses and Jackson & Perkins. Keep diggin for those dogtags! Oh, is there any way to contact the previous property owners? Odds are they are the ones that planted these roses in the first place. we're located in a town called Naugatuck, which is just south of Waterbury, CT. We're probably about 30 miles from Long Island Sound (not the ocean, but the body of water separating CT from Long Island. Long cold winter but we don't necessarily have snow cover all winter. It would be tough to tough to get under the soil at this point as we do have a foot of snow over frozen ground. Is it safe to say, that we can wait til spring, then do some light pruning?